Season 3 that began on Syfy on Tuesday, April 17th at 9/8c. Expand the Paranormal with Syfy's Fact or Faked: Paranormal Files Team Lead, Ben Hansen. talks about Season 3 that premiered on April 17th. Listen in on tonight's interview with Fact or Faked: Paranormal Files Team Lead, Ben Hansen while we talk about Season 2.5 and what is coming in the next season the team is currently out filming. Host, Christiane Elin speaks with Syfy's Fact or Faked: Paranormal Files Team, Lead Scientist, Bill Murphy, Stunt Expert, Austin Porter and Tech Specialist, Devin Marble about the new season that begins on Wednesday, October 19th, 10/9c. While out filming Season 2.5, Fact or Faked will celebrate it's one year anniversary on July 15th! Join host Christiane Elin in celebrating this milestone with the Fact or Faked Team! Fact or Faked Team Lead, Ben Hansen, Journalist, Jael de Pardo and Tech Specialist, Devin Marble will be joining the show live. Stunt Expert, Austin Porter and Lead Scientist, Bill Murphy recorded a message to the fans. 1 signed prize will be given away during the show. Tonight's show will focus on Syfy's Season 2 of Fact or Faked: Paranormal Files with the Fact or Faked Team Lead, Ben Hansen, Lead Scientist, Bill Murphy, Stunt Expert, Austin Porter and newest addition Tech Specialist, Devin Marble. Fact or Faked: Paranormal Files returns on Wednesday, March 23rd at 10/9c. Syfy's Fact or Faked: Paranormal Files Lead Scientist Bill Murphy and Stunt Expert Austin Porter Guest. Team Lead, Ben Hansen makes a surprise call into the show. Pre-Approved fan callers call-in and ask the questions they have been dying to get answered! 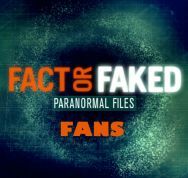 Syfy's new hit Thursday night paranormal show, Fact or Faked: Paranormal Files Team Lead Ben Hansen and Stunt Expert Austin Porter joins in to take fan's questions and shares with us how filming Season 1.5 is going. Fact or Faked returns on Thursday, October 28th on Syfy 10/9C. Fact or Faked: Paranormal Files Fan Call-In Show with Fact or Faked Stunt Expert, Austin Porter, Effects Specialist, Larry Caughlan, Jr. and Team Lead, Ben Hansen. The Fact or Faked team takes the fan's questions. Fact or Faked: Paranormal Files Team Chi-Lan Lieu, Austin Porter & Larry Caughlan Jr. Fact or Faked: Paranormal Files Photography Expert Chi-Lan Lieu, Stunt Expert Austin Porter and Effects Specialist Larry Caughlan, Jr. join us to talk about their Syfy show now airing on Thursdays at 10/9c. Effects Specialist Larry Caughlan, Jr.